Troy Wayman, vice president of economic development for the Mobile Area Chamber of Commerce, said the first day of the Farnborough Air Show was busy early, but heavy thunderstorms and power outages caused it to close early. “We made calls on a number of existing companies we have relationships with,” he said. 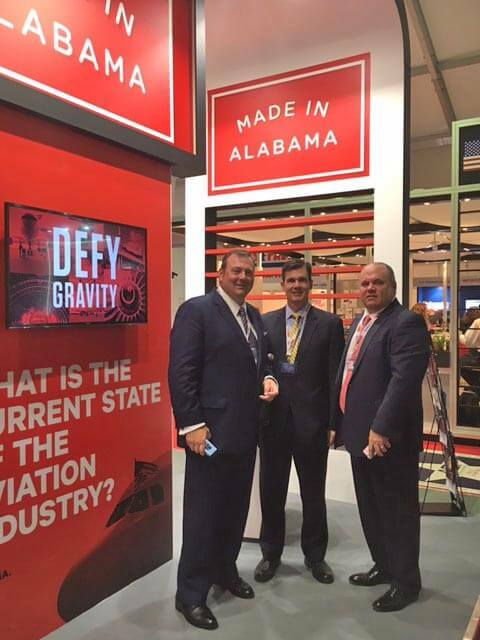 (Courtesy of the Mobile Area Chamber of Commerce) Troy Wayman with the Mobile Area Chamber; Patrick Murphy with Alabama Power; and Britton Bonner with Adams & Reese/City of Mobile at the Alabama Pavillion at the Farnborough Air Show. Wayman said Tuesday’s focus will be on interacting with existing industries with appointments with Airbus and Singapore Technologies as well as several smaller supplier industries that have recently announced setting up shop in Mobile. 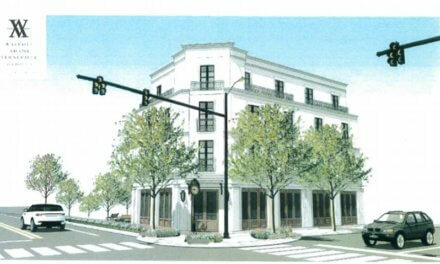 In addition to the show, a Mobile delegation including Mayor Sandy Stimpson, Mobile County Commission President Jerry Carl; Mobile City Council member Fred Richardson; Mobile Area Chamber President Bill Sisson; and others from the University of South Alabama, the city, county and Chamber participated in three site visits to London technology/start-up incubators and accelerators on Monday. Tech City UK – This group’s mission is to accelerate growth of London and the UK’s digital community. They focus on digital skills, smart capital investment, infrastructure, international development and training. Their three main ways of supporting companies include: targeted programs filling market gaps across the whole life cycle of digital businesses; engaging, policing and convening by providing an agile and responsive feedback loop to government; and effective promotion and thought leadership by championing and connecting the digital sector in London and the UK internationally through trade missions, media engagement and events. Level 39 – Europe’s largest technology accelerator space for finance, cyber-security, retail and smart-city technology companies. They offer their 200 members a curriculum with at minimum seven hours per week of education and training; expert mentors and various events. It is wholly owned by the Canary Wharf Group, and was started in 2013, Currently the accelerator takes up three floors in One Canada Square. Level 39 is synonymous with FinTech (financial technology), and has recently started a 50-desk zone dedicated to accelerating smart-city companies called Cognicity Hub. techUK — More than 900 companies are members of techUK, and collectively they employ more than 700,000 people (about half of all technology sector jobs in the UK). These companies range from FTSE 100 companies to innovative start-ups. techUK works with its members by helping them develop markets, develop relationships and networks, reduce business costs and reduce business risks. As the Mobile Chamber and USA await word on a federal grant to finalize the purchase of a building on St. Louis Street to house Innovation PortAL, these visits were good for the delegation to learn more about what services incubators are providing their tenants, and how to engage them in mentoring and training.